Thailand is the perfect honeymoon destination. Countless tropical islands all offering a unique experience, scattered in the warm seas of one of the most beautiful regions in the world. Experience the wonders of mainland Thailand and travel to a selection of islands, or pick one spot to rest and relax for a couple of weeks – there is a huge amount of choice when it comes to planning a Thailand honeymoon. Honeymooners in Thailand are spoilt for choice for things to do. 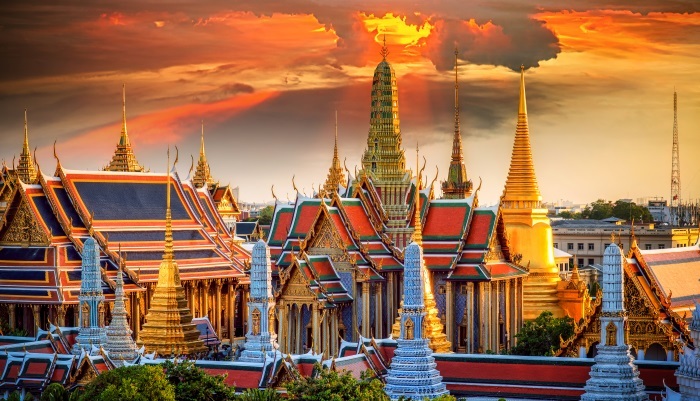 We recommend starting your travels off in Bangkok, which is a city that needs to experienced at least once. Its energy and sense of fun is infectious, and nights out on the town will involve incredible food and drink on rooftop bars, catching a tuk tuk down to the riverside where you can take in a show or go to a live music venue. During the day, nothing can beat hopping on a boat and travelling through the waters to get to a new island. There is a huge number of cruises and day trips available, where lunch and drinks can be enjoyed on board. We also recommend diving, visiting the lively markets (in particular the Damnoen Sauduak floating market and Chang Mai Bazaar) and visiting some of the many temples like the mesmerising Wat Arun and Wat Rong Khun. Nestled in the Andaman Sea and Gulf of Thailand, Thailand is one of the most popular places to visit in south east Asia. This has allowed them to develop a well-honed tourism industry that offers the perfect backdrop for honeymooners as well as backpackers and families. From the simple beachfront bungalows to exclusive luxury resorts, there’s a massive choice in where to stay. But when it comes to recommending must-see places, we recommend spending at least a few days in Koh Phi Phi Don, Koh Samui and Ko Mak. Nantra de Deluxe on Krabi is a wonderful relaxing experience with its private terraces, botanical gardens and pool villas. We also love the White House Hotel on Koh Samui which has everything you need and is furnished with a blend of ancient Asian fittings and modern gadgets. The smaller islands have an ideal honeymoon vibe in terms of privacy, luxury and peace. However, if you’re up for somewhere a bit livelier, the chilled beach bar vibes of Phuket or the Full Moon parties of Ko Pha Ngan might appeal. For peak weather, we recommend scheduling your honeymoon to Thailand between November to March. But because Thailand is such a geographically long country, there are various areas that experience different weather throughout the year. Northern Thailand is best between November and May. If you’re looking to head south, bear in mind that the wettest months are between April and October and the east coast has heavy rainfall from September to December. However, during the rest of the year, dry and sunny weather is enjoyed. If you’re planning a post-wedding trip to Southeast Asia, there is a great choice of cheap honeymoon deals to Thailand. Plan carefully, and you could experience free spa treatments, unbeatable package deals and discount excursions to see hidden beauty spots in the country. Let Destination2 find the best honeymoon deals in Thailand for you.